Any organization is best defined and understood by the positions that organization takes on various issues. HSVMA has adopted positions on a variety of topics or issues that we believe have animal welfare implications. In cases where we have done extensive reviews or work on a position, we have included a link to our full policy statement that presents the detailed philosophy and rationale for our rules of engagement on that issue. Positions are arranged by subject category, whereas policy statements are arranged strictly alphabetically and not in the order of perceived importance. The HSVMA recognizes and endorses the Five Freedoms as the base line for appropriate animal welfare. The HSVMA believes veterinarians have the responsibility to educate clients about all aspects of the cost of care. The HSVMA believes that appropriate anesthesia must accompany all surgical procedures on animals. The HSVMA supports mandatory reporting by veterinarians of suspected animal cruelty. The HSVMA believes that the relocation of pets for adoption to different geographical areas should be preceded by appropriate veterinary exam and oversight. The HSVMA opposes ear cropping and tail docking solely for cosmetic purposes. The HSVMA opposes horse tripping. The HSVMA opposes the force feeding of ducks and geese to produce foie gras. The HSVMA supports restriction of the non-therapeutic use of antibiotics in animals used in food production. The HSVMA opposes the practice of confining egg-laying hens to battery cages, a housing system which denies the birds an adequate amount of space and prevents them from carrying out fundamental natural behaviors. The HSVMA opposes the practice of confining gestating sows in individual crates only slightly larger than the animals themselves, commonly known as gestation crates. The HSVMA opposes the practice of shark finning. The HSVMA opposes the practice of “Velveting” (Removal of living antlers from deer). 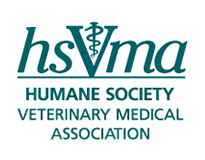 The HSVMA opposes the removal or reduction of healthy teeth in nonhuman primates and carnivores. The HSVMA opposes the use of steel jawed leg hold traps for wildlife capture and control. The HSVMA opposes the private ownership of dangerous and exotic animals.